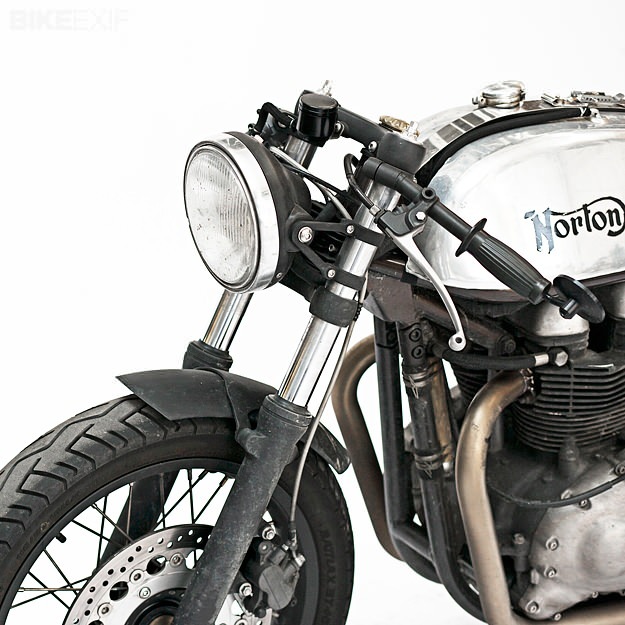 There seem to be endless permutations of the classic Triton motorcycle. 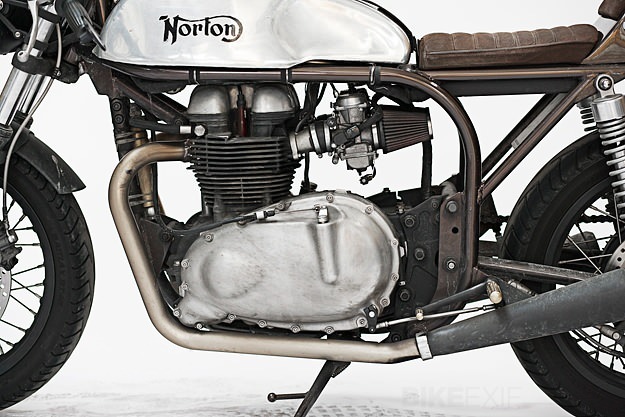 But I haven’t seen this mix of old and new before: It’s a modern Hinckley-built 865cc engine in a 1954 Norton frame. 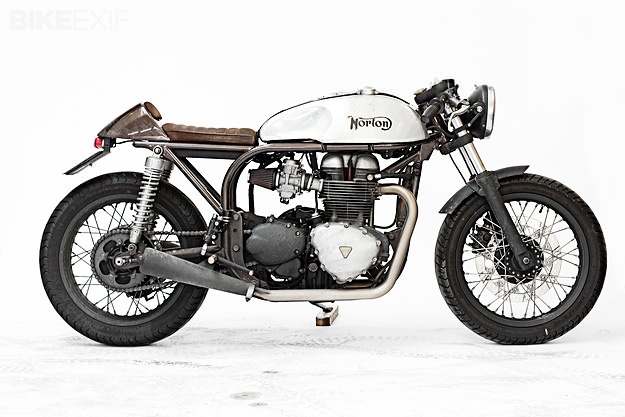 ‘Featherbed 865’ is the ingenious creation of 31-year-old Scandinavian mechanic Lars Lykkegaard, who found himself with a troublesome Triton powered by an old 650cc Bonneville engine. “It always had problems with the charging system, or it would eat the spark plugs all the time, even though I fixed the carbs and the wiring,” he says. 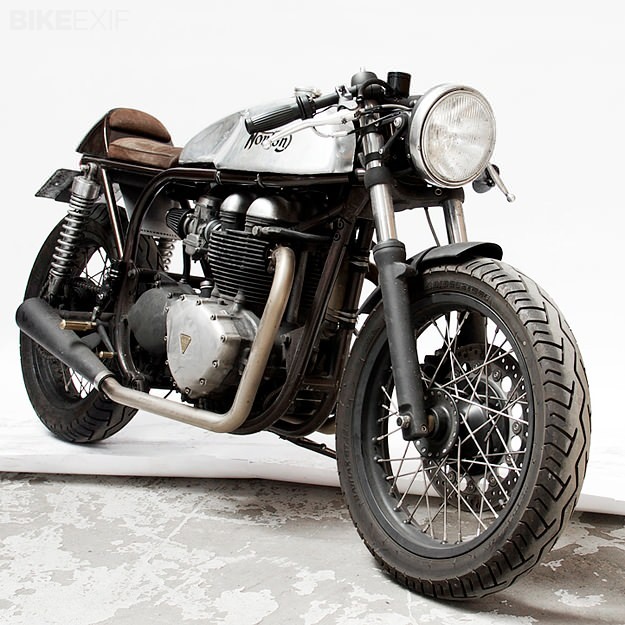 In October 2010, Lars stripped down the old Triton and the new Thruxton. Another friend began milling all the custom parts, including the clip-on bars, yokes, engine converter plates and brake caliper brackets. Lars also designed and fitted new connection brackets onto the frame, new foot controls, brass footpegs, a brass oil cooler and a neat little brass ‘865’ logo for the engine. After a few modifications to the old frame, the new engine slotted in. The fuel pump and filter for the fuel injection are now concealed within the tank—a 1960s original. 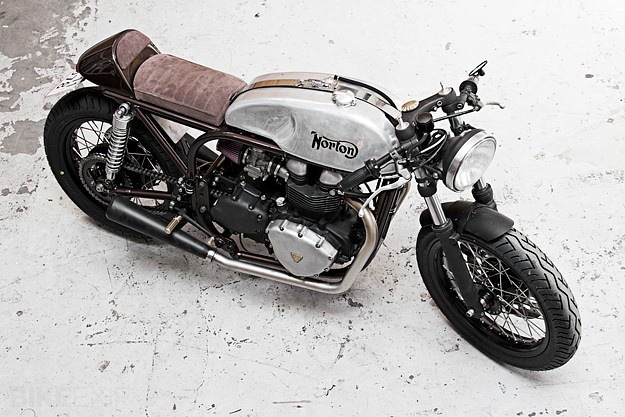 The forks are from the Thruxton, lowered 50mm. The brakes, suspension and 18” wheels are also from the donor bike, although Lars rebuilt the wheels with stainless steel spokes and fitted Bridgestone tires. The exhaust is homemade, again in stainless steel. ECU and a Motogadget M-Lock ignition replacing the traditional key, the Triton was ready to roll—almost 1½ years after the build started. After a ten-kilometer test run, Lars took the Triton on a huge cross-Europe trip in the summer. “During the trip I had to tighten a few bolts and change the light bulb, but it handled like a baby in the Alps. If this was a build from a major custom shop, it’d be impressive enough. 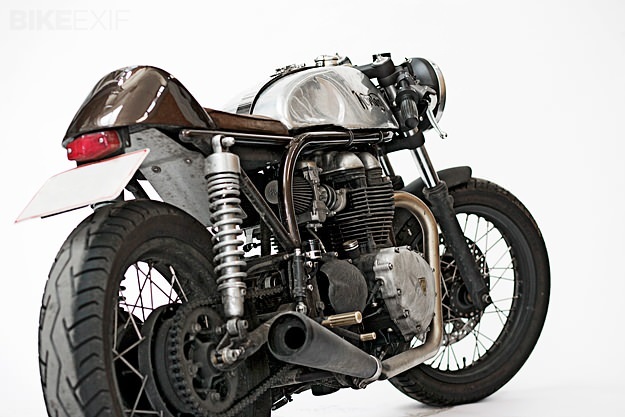 But Lars built his cafe racer in a small home garage, through a cold Northern European winter. A new project is on the way, I’m told, and I can’t wait to see what it is.